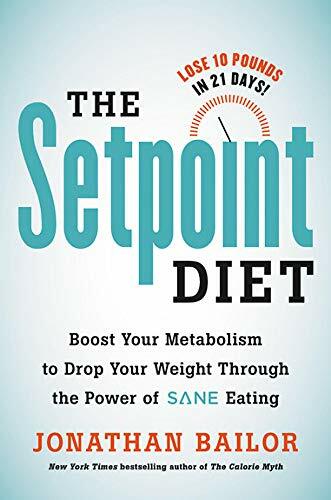 Titre The setpoint diet : the 21-day program to permanently change what your body "wants" to weigh / Jonathan Bailor. Éditeur New York, NY : Hachette Books, 2018. Your body fights to keep you within a range of about 15 pounds--also known as your "setpoint weight." New research reveals that you can lower your setpoint and end that battle for good by focusing on the quality of calories you eat, not the quantity. With The Setpoint Diet, you will reprogram your body with a 21-day plan to rev up your metabolism, eliminate inflammation, heal your hormones, repair your gut, and get your body working like that of a naturally thin person--permanently. The Setpoint Diet is a lower-carb menu that focuses on specific anti-inflammatory whole foods, including tons of produce, nutritious proteins, and therapeutic fats. Its creator, Jonathan Bailor, founded SANESolution, a weight loss company that has reached millions of people. Proven to help you lose weight naturally and maintain it, The Setpoint Diet is your new blueprint for healthy living. Contenu Introduction: Your weight is not your fault -- Part 1. The hidden key to lasting weight loss : your setpoint. Unlock the naturally thin you -- The three hidden factors that determine your weight -- Part 2. SANE foods. Good calories, bad calories, and SANE calories ... oh my! -- Non-starchy vegetables -- Nutrient-dense proteins -- Whole-food fats and sweets -- Smoothies and beverages -- Part 3. SANE meals, cooking, and nutraceuticals. Meal planning for a lower setpoint -- Cooking and every recipe you'll ever need -- Diet pills, bad. Nutraceuticals, good. -- Part 4. SANE exercise. Exercise less, lower your setpoint more -- The 20-minute-per-week SANE exercise program -- Part 5. SANE mind-set. Love yourself slim -- Simple setpoint-lowering habits -- The 21-day SANE setpoint solution -- #SANE4Life -- Appendix A. SANE setpoint-lowering recipes -- Appendix B. Diabesity : the hidden epidemic that's 19 percent more deadly than cancer -- Appendix C. Next steps and SANE solution resources.